Sherlock Holmes, definitely! I saw it and it's awesome! I used to work at a record store that had a great movie rental department and one of the perks of closing was taking home whatever we wanted to watch. This was in the VHS era, of course, but it was still a pretty sweet deal. I can't count the number of times I stayed up all night watching movies. Ah, the good old days. Nowadays I'm hard pressed to find time to go out and rent movies without the kids in tow. I sincerely wish there was a Blockbuster Express kiosk nearby, it seems like a super convenient way to rent movies. You can preorder up to three DVDs online to pick up at your neighborhood kiosk whenever you want, how cool is that? (Click here to see if there is a location near you.) Did I mention each movie is only $1 per night? Nice. The Presto Orville Redenbacher's hot air popper pops regular or gourmet popcorn with hot air, not oil for a low calorie treat. Makes up to 18 cups of popcorn in under 2-1/2 minutes leaving virtually no unpopped kernels. Disclosure: I have not received any compensation for writing this post but I am a member of Collective Bias and Blockbuster Express is their client. 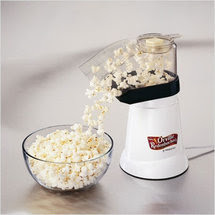 I think someone should get a cool prize like this popcorn popper, even if I don't get one, right?! To enter and win a popcorn popper courtesy of Blockbuster Express, please comment on this post with your favorite new release listed on their website. Entries will be accepted through April 14th and I'll pick the winner using Random.org. US readers are eligible. For an additional entry, sign up for the Blockbuster Express New Release email newsletter, follow Blockbuster Express on Twitter, fan Blockbuster Express on Facebook, post my button on your blog (see code on sidebar), follow my blog, follow me on Twitter, fan me on Facebook, fave me on Technorati or subscribe via email or subscribe via reader. Leave an extra comment letting me know what you did for each additional entry. My favorite new release is The Blind Side :) *Thanks* for the giveaway! I am a member of Blockbuster Express and receive their newsletters. Facebook fan of your blog! This air popper would be fabulous to win because my husband and I have to watch our cholesterol! My favorites would be Sherlock Holmes and Did You Hear About the Morgans? The Blind Side love to see that movie. My favorite new release would be New Moon! I loved the Blindside and air popped popcorn always reminds me of being a kid. i cant wait to see the blindside again! We have been wanting to see Men Who Stare at Goats! I am now a FB fan! brothers is my fav new release. I signed up for the Blockbuster newsletter. I am a fan of blockbuster express on facebook. I subscribe via email ! would love to see the blind side with sandra bullock! I so want to see the Blind SIde. I really want to see Sherlock Holmes! I signed up for the Blockbuster Express New Release email newsletter. I like The Blind Side! I'd like to see their new release of Sherlock Holmes! My favorite new release listed on their website right now is sherlock holmes.